Welcome to West Elementary School. West Elementary currently serves students Pre-K through the fifth grade. Our teachers, administrators, and staff are committed to providing a safe and nurturing learning environment for our students. Our students are at the heart of everything we do here at West Elementary. We believe that EVERY child deserves the very best education possible. West Elementary was constructed in 1964-65. It was built on the 12 acre site of the old McMinnville Country Club golf course. Because of its central location within the city, West Elementary has been involved with city and community activities. Parents and citizens of our community are always welcome at West Elementary. If you have any questions or would like to tour the school, please give us a call at 931-473-3801. We thank our current parents for entrusting their children to our care and we look forward to welcoming new families to our school community in the near future! Together as a school community, we will build on the traditions of the past and meet the challenges of the future in innovative and exciting ways. When a student is absent, a note is required. This note is to be presented to the student’s homeroom teacher within three (3) days of the absence. The note should include the reason(s) for and the date(s) of the absence. The school may accept a written note from a parent or guardian verifying a student’s illness for up to a total of 5 accumulated days during the school year. However, if a student is absent due to his or her personal illness for more than a total of five accumulated days, a doctor’s note specifying inclusive dates for the illness must be submitted in order for any subsequent illness-related absences to be excused. 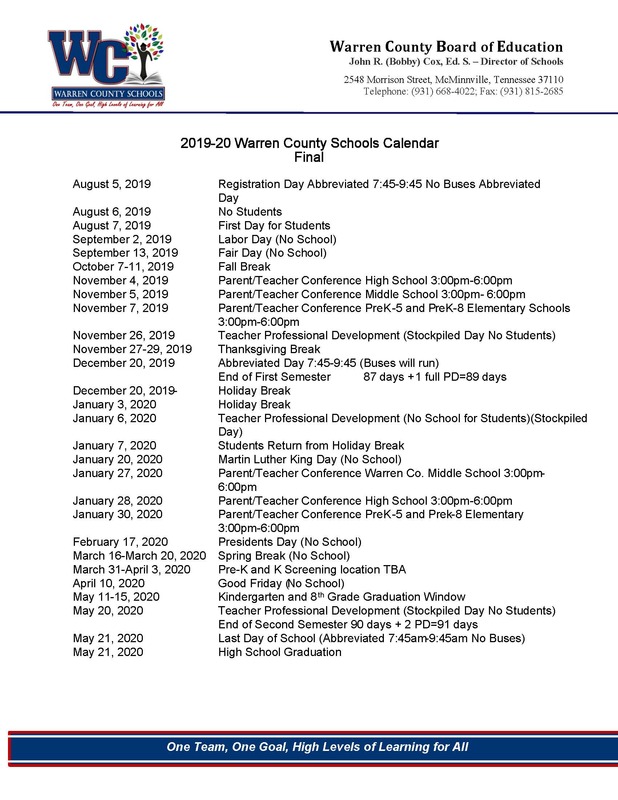 Warren County School Board policy states that if and/or when a student commits his/her third unexcused absence a letter and/or phone call will be sent to the parent or guardian, by the school in which the child is enrolled. If and/or when a student commits his/her fifth unexcused absence, that student’s name and the facts of such unlawful absence can be reported to the juvenile authorities.